With Busvermietung Brandenburg, you and your travel party can pre-book diverse categories of motorbuses with conductor. On the basis of the desired number of seats, we are looking forward to help you reserve coaches of any capacity for your movement in Brandenburg. We and our partner bus companies invite you to opt from the following bus categories. Whichever choice you make, the team of tour operator City Tours Germany can safeguard to provide you with the most outstanding minibuses and buses from Brandenburg for your transfers. Passenger cars with motorist in Brandenburg: If you want to reserve a regular passenger car, an oldtimer automobile, or a limousine, we are eager to help you hire vehicles with regular dimensions with a driver in Brandenburg. Moreover, we can also drive you to Mecklenburg-Vorpommern, Berlin, Saxony, Saxony-Anhalt, Lower Saxony, and to any place of your choice in Germany. Midibuses & microbuses with conductor in Brandenburg: For rides of medium tourist groups, we rent out small and tiny buses with operator in Brandenburg. And of course, these vehicles are also available for a sightseeing tour to Poland, to Czech Republic, to Denmark, to Belgium, to Netherlands, as well as to each and every place of Europe. 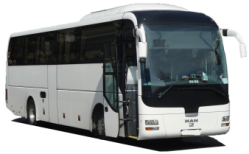 Conventional coaches with operator in Brandenburg: If your group has many passengers, we will happily hire out reliable buses and two storey buses with operator for any type of journeys within Brandenburg as well as in entire Germany. Certainly, you and your guests can command our well-maintained buses for long-distance tours outside Germany, like to the closeby countries of Poland, Czech Republic, Belgium, Netherlands, and Denmark, or to other places in Europe.
. We kindly ask you to specify the general specifications in your letter of inquiry: passenger headcount, place of meeting and ending, preferred route, dates and times. If we have these criteria, we will immediately transmit you a quotation for your bus charter in Germany and all of Europe.